The Baader Color Filter Set includes a selection of six filters. Each is a disc of colored glass ground to be plane parallel and then polished until very smooth, antireflection coated, then housed in machined aluminum cells. These filters vary by color and by density. 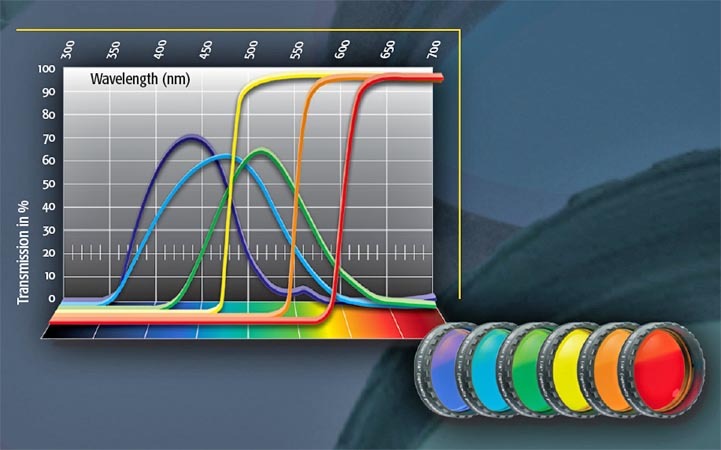 This selection of filters include lighter and darker variations of red, green, yellow and blue. We offer them as shown on this page in 1.25 inch diameter thread on housings, we also offer a 2 inch color filters set also with thread on housings. Note these sets are sold ONLY by the set of six (6) assorted colors. How do they work? The human eye integrates light that is comprised of three basic colors (red, green, blue) to form an image. Color filters are used to attenuate some portions of the spectrum thereby reducing the brightness of the image to some degree and helping to see some of the fainter colored aspects appear more pronounced. 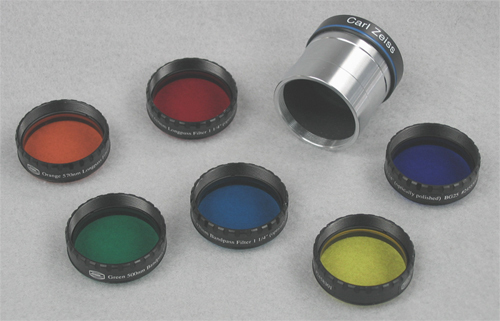 Right: Baader color filters provided in the set with optional Carl Zeiss Abbe Ortho 4 mm eyepiece for scale (68,093 bytes). Click on image for enlarged view (101,783 bytes). These filters each have some area of usefulness in astronomical applications. In smaller telescopes they are useful at bringing out subtle details when observing Venus, Mars, Jupiter, Saturn, the Moon. When used with larger telescopes they are then a useful aid when observing Mercury, Neptune and Uranus too. Some filters show quite dramatic improvements in contrast, this is particularly so when using the red filters while observing in sky light polluted areas. But more often than not the effects of these filters are subtle. And while there are observers who can not due without their color filters these people tend to be the more patient observers who have trained their eyes to look for subtle differences on the planets. Filters can be useful too for photographic or video applications as the filters are accommodated by many of our camera adapters or compact CCD systems. The glass elements used to make the Baader Color Filter are free of striae, optically finely polished plane parallel to within 30 seconds of arc. This eliminates any double images or ghosting due to wedge errors in the glass. These filters tend to far supersede the quality of common color filters which are flame polished. The combination of their fine optical craftsmanship and a comparatively thin 2 mm profile allows these filters to be inserted anywhere into the optical path without introducing astigmatism or other noticeable defects into the image. For instance they can be installed in the front of a Binocular Viewer without degrading the image in any way. Both surfaces of filter element have applied onto them a seven layer multi-coating to reduce the possibilities of any unwanted reflections. This provides reduction of residual reflections to a mere 0.25% that might otherwise produce a ghost image. This is the most elaborate coating ever applied onto amateur color filters resulting in a filter free of any false reflections under any incident angle of light. This critical prevention of light scatter is among the more important aspects of planetary observing. While at first glance they appear similar to common "Wratten" series color filters (such as those in our Questar Color Filter set) these Baader filters are not that simple. The set comprises six filters, of these three are longpass passing light from one wavelength either up or down. And three filters are genuine bandpass filters behaving in some ways similar to a nebula filter so that only a small portion of the visual spectrum is transmitted to emphasize certain planetary surface detail. You can see the differences in the chart below at right. Color, Transmission peak, and Part Number. Click on the filter designation to see that filter's transmission graph. Red (610 nm) Longpass P/N 2458307. Above Right: Baader color filters transmission curves. (111,052 bytes). Click on image to see enlarged view (164,803 bytes). The transmission efficiencies for the three longpass-filters (Yellow, Orange and Red) peaks at ninety eight per cent, while the efficiency for the three bandpass-filters peaks at from about sixty to seventy percent; this efficiency is unheard of for a simple colored glass-filter! This very high light transmission allows the subltest planetary surface detail to be detected at high magnifications. All filters will thread into conventional slip fit eyepieces or accessories with the common 1.25 inch diameter x 42 tpi (28.5 x 0.6 mm) threading; this thread pattern has been tested and optimized to fit allmost all eyepieces on the market. Stackable filters: Each filter cell incorporates both a male and a female thread to allow stacking the filters to obtain narrower passbands, or to combine the effect with our UV/IR Rejection Filter. For instance, combining the Yellow filter with the Blue-Violet filter results in a very narrow dark green filter that transmits light only from 475nm to 500nm. You can also combine the color filters with other filters. We recommend using the Yellow filter with the Baader Neodymium Moon & Skyglow filter to boost the contrast on Mars. The combination of the Red 610 (# 2458307) with our UV/IR Cut/Rejection Filter (# 2459207) for instance results in an extremely narrow H-α passband-filter at an incredibly cheap price, and with no reflections or stray light. When stacking filters on eyepieces however, be careful that the eyepiece barrel with the filters attached does not protrude in far enough to strike the mirror or prism of your diagonal. The filter cell features the largest clear aperture of any 1-¼ filter on the market - for complete freedom from vignetting at any focal length. The front crown of the cell incorporates milled notches which makes handling and threading the filter an easy operation in the dark. The filter element is housed in a machined aluminum cell, retained by a thread in retaining ring. The filter name, size and part number are in silver, and this mirror like print when combined with the fine print make this information difficult to read under dim red lighting. Company Seven recommends our customers keep these filters in well organized accessory cases, so that you know which filter is which. It helps to become familiar with how the elements appear too. For protection, each filter is provided with its own transparent plastic case. We are astonished however, that as outstanding as the filters are, plastic case latch tend to fail sometimes even when new. Company Seven therefore offer optional third party cases. 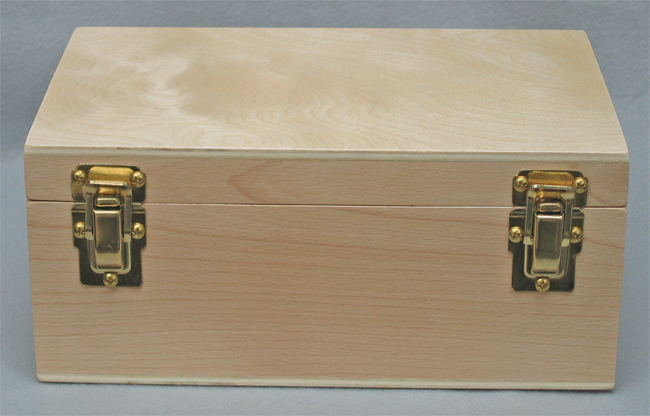 And for the most discriminating clients, we even offer a custom made wood accessory case described below. This optional wood case is foam lined with cutaway spaces for each filter, eyepieces and other small accessories for your telescope. Please refer to our price list for current prices for the filter set and the optional case or contact Company Seven for more information. Click on the image to see enlarged view (190,049 bytes). Baader Planetarium Color Filters One page illustrated overview of the Baader Planetarium Color Filter Set includes filter transmission curve graphs. Publication content by Baader Planetarium, all rights reserved. From Company Seven's Archives (302,432 bytes in Adobe .pdf). Baader Planetarium Professional Astronomical Filters one page color illustrated overview of several Baader specialized astronomical filters including the Oxygen III Very Narrow Band Nebula, Contrast Booster, Color Filter Set, UV-IR Rejection, Fringe Killer, Moon and SkyGlow, Solar Continuum, UHC-S High Transmission Nebula, and U-Filter. Includes filter transmission curve graphs. Publication content by Baader Planetarium, all rights reserved. From Company Seven's Archives (127,011 bytes in Adobe .pdf). It is best to protect the filter from sharp edges or any item that could cause a scratch or abrade the glass. When not in use, store the filter in a its provided rigid container, and it may help you to keep them organized in a fitted carrying case. Dew may form on the filters, if this happens do not store a wet filter into its airtight container for long periods of time; whenever possible let the filter "dry out" in order to reduce the potential for problems developing associated with Fungus, etc. Draw any large, loose bits of foreign matter from the surface of the glass with an air bulb or small vacuum. Stubborn particles can be removed with a soft camel's hair brush. Throughout the year, but especially in cold climates when static become more of a problem we particularly recommend the use of a Staticmaster brush. Place a few drops of an approved lens cleaning solution (by Carl Zeiss or Kodak) or mild soap solution of clear dish washing liquid diluted with distilled water onto a cotton swab. Then gently wipe in a circular motion with little or no pressure. The filter can be damaged if there are tiny abrasive particles on the surface which are pressed in by rubbing hard.